The battle of rookie quarterbacks went the way of the Chicago Bears, as they defeated the Cleveland Browns 20-3 at Soldier Field. Neither QB DeShone Kizer nor QB Mitchell Trubisky had a passing touchdown as they were forced to battle the elements, but Trubisky did having a rushing touchdown. Besides going 14-of-23 for 193 yards passing, Trubisky had 44 rushing yards on seven carries. RB Jordan Howard was relied upon heavily, rushing 22 times for 44 yards and two touchdowns. Kizer was 18-of-36 for 182 yards and two interceptions. RB Duke Johnson Jr. had a total of 101 yards rushing and receiving, touching the ball 11 times on offense. The Browns weren’t able to get much pressure on the rookie quarterback despite blitzing him on 18 of his 32 dropbacks, and the Bears’ signal-caller took advantage of it. On plays without pressure, he produced an NFL passer rating of 93.3, compared with 62.5 on plays where pressure got to him. Running back Jordan Howard has made life difficult for his AFC North foes this season, with game-defining plays against both the Baltimore Ravens and Pittsburgh Steelers. While he found the end zone twice against the Browns, Cleveland’s defense actually did a pretty good job of bottling him up, allowing just 0.68 yards before contact per carry on the day. 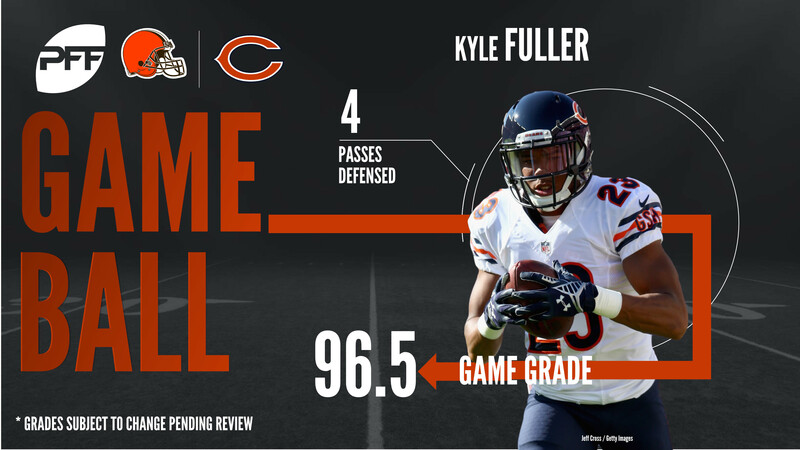 Fuller had a day for the ages against the Browns on Sunday afternoon. Even though he was Chicago’s most frequently targeted player on defense, he allowed no receptions on nine targets and also had an interception and four pass breakups. As a result, he allowed a passer rating of 0.0 on passes attempted into his coverage. Hicks led a Bears defensive line that wreaked havoc against Cleveland’s offensive line all game long. He was successful rushing the passer, as he picked up one sack, one hit and two quarterback hurries on 34 pass rushing snaps. However, his best work came in run defense as he stood up blockers, made two run stops and also drew holding calls in the run game. Johnson was Cleveland’s best player on offense on this afternoon, being his best as a receiver. Johnson caught seven of QB DeShone Kizer’s completed passes and hauled in all of his catchable targets. Furthermore, he was very dangerous after the catch, as he earned 83 of his 81 yards after the catch and he broke a tackle as well. Kizer had a tough game, completing just 1-of-10 pass attempts 10 yards or further downfield while his receivers failed to win contested situations. Cleveland’s rookie signal-caller also struggled under pressure, as he completed only 5-of-15 attempts under pressure and had a passer rating of 19.4 when Chicago’s pass rush got to him. McCourty’s fine season in Cleveland continued on Sunday despite allowing a 40-yard reception on the day. Targeted four times, he allowed just three receptions for 52 yards. So, outside of the 40-yard play, there wasn’t much to be had on throws into his coverage. Garrett picked up an injury during the game but did return, and he once again showed some of the flashes that should give Browns fans hope for the future. From 25 pass-rushing snaps, he picked up a sack and a hurry and would have had his first career touchdown on an interception return if not for an offside call against Carl Nassib.